Drug resistant parasites are a rising concern to the livestock industry. Caribbean hair sheep are known to be parasite resistant and are especially recognized for robust performance in the presence of gastrointestinal nematodes. Hair sheep have become an important part of the U.S. sheep industry. Lack of wool eliminates a number of health concerns and drastically reduces the cost of production. Despite the growing importance of hair sheep in the Americas their genetic origins have remained speculative. In this presentation, we combine historical research with archeological evidence and modern day computational genomic methods to uncover the unique ancestry of these breeds. Prior to this report no genetic studies were able to identify a unique geographical origin of hair sheep in the New World. 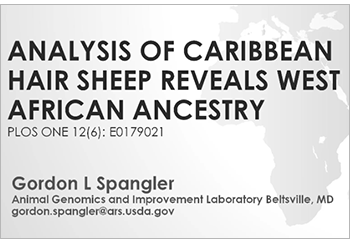 Our study clarifies the African and European ancestry of Caribbean hair sheep. Whole genome structural analysis was conducted on four established breeds of hair sheep from the Caribbean region. Using breeds representing Africa and Europe we establish an objective measure indicating Caribbean hair sheep are derived from Iberian and West African origins. Caribbean hair sheep result from West African introgression into established ecotypes of Iberian descent. Genotypes from 47,750 autosomal single nucleotide polymorphism markers scored in 290 animals were used to characterize the population structure of the St Croix, Barbados Blackbelly, Morada Nova, and Santa Ines. Principal components, admixture, and phylogenetic analyses results correlate with historical patterns of colonization and trade. These patterns support co-migration of these sheep with humans. Our results will contribute to discovery of more detailed exploration of trait loci, as well as provide valuable information for sheep breeders in the face of economic change, global warming, and the increasing pressure of drug resistant parasites. Gordon Spangler is a Computational Biologist at the ARS-USDA. He started out as a Molecular Biologist doing Cancer Research at Johns Hopkins and later on at the Cancer Institutes in Bethesda, MD. After the Human Genome Project came out, he became very interested in the analytical platforms and did his PhD in Analytical Chemistry. At that point, Next-Generation Sequencing came out, and he worked private sector primarily focused on next-generation genotyping and sequencing platforms. During this time, he developed an intense interest in computational biology which led him to his current position at the ARS-USDA.